When open data advocates talk about the potential economic impact of the movement, it's clear there are big benefits and barriers for cities in California--except for the barrier of not knowing about the open data movement. "Five or seven years ago it was a very foreign concept," said Peter Koht, founder of OpenCounter. "But, in recognizing the power that we all carry around in our pockets right now and that so many of those applications are based on government data, I just think at this point that the movement has gained enough momentum that it will be the standard in the coming years." In the past several years, large sets of government data have now come to represent possible new business opportunities. Startups like OpenCounter, which helps small businesses navigate government agencies, and Appallicious, which was born from San Francisco open data sets, have popped up and created economic impact in their own ways. Both the potential and barriers of open data were on display at an open data regional forum held last week in Long Beach by California Forward. "It gives everyone the same opportunity to create the next big thing or think of a great idea or bring a team forward to solve a challenge," said Long Beach Mayor Robert Garcia, who spoke to the group about the City's data efforts. "And it puts really the burden then on the public, not just with whoever's working with that data set, but on everyone." 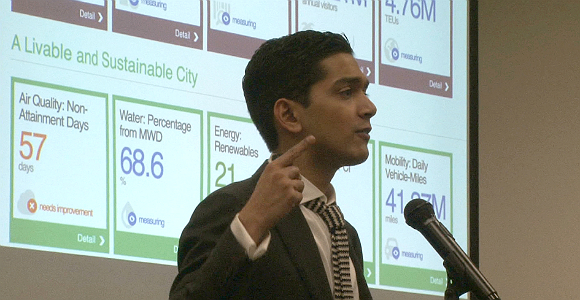 To push forward Los Angeles' open data effort, the City recently created the job of "chief data officer" and appointed Abhi Nemani, formerly of Code for America. "The U.S. government alone spent $170 billion on I.T. and tech in 2014," said Nemani, speaking at the forum. “Compare that to the $10 billion video game industry." Clearly there's money to be made by data-savvy entrepreneurs. At the same time, the return on investment for both public and private entities includes being able to use that data for better decision making when facing economic questions. This year Governor Brown signed a bill that will create workforce data dashboard to better inform state college education programs. The effort will gather data scattered around different agencies and analyze it, plus make it public. The idea is to make that piece of the state's workforce development a more transparent, accountable and efficient process. So, the economic opportunities are there and a lot of people are on the same page regarding the benefits for government. But cities have to commit the time and money not just opening up data but standardizing how it's converted from raw format and how it's presented for download. On top of that is the cost of keeping it up to date. "I think standardization is probably the most important thing to think about when we're trying to develop tools like OpenCounter," said Koht. "Almost all governments in California publish some kind of geospatial information. But it's usually left up to the individual agency of what they want to publish, what the headers are, what type of metadata that file has. If we were to come up a statewide or even nationwide standard for either parcel data or just new ways to think about publishing our municipal codes, we could really make these a lot more accessible to people interacting with public agencies." Even if a city has resources to convert and open up its data, local governments need leadership to make sure the process doesn't stagnate and actually does see the economic return-on-investment, like an increase in tax revenue from new economic activity. Los Angeles has been trying to be a model for other cities with its data portal and work to build a local data community. "There's a lot of cities already stepping up," said Nemani. "I think there's going to be an organic growth to open data throughout the state. I think beyond that just it's a question of leadership. You need people to be specifically focused on this or else it won't get as far as it can." Along the way cities also have to figure out which data sets are the most valuable for entrepreneurs and be smart about what they spend since not all data sets are going to have the same economic value. Zillow is often cited as a government data success story of the combination of multiple county records with multiple real estate listing services to create an app. At the same time, cities and other levels of government should take advantage of open data when tackling other long-term economic puzzles like land-use planning and infrastructure issues. "I think in understanding where infrastructure should go and what should be built data is really helpful," said Nemani. "Our parks department, for instance, actually uses data to do predictive modeling of where new parks ago and the use that make infrastructure investments." Finally, cities also would benefit from having a robust local open data community that can take advantage of the data and collaborate on ideas. Events like California Forward's ongoing regional data roadshow should help change the culture inside the government and out in the private sector. "I think that the work that the work that California Forward and Code for America, that Bloomberg and others are doing is is what's needed right now," said Garcia. "I think cities are taking advantage of that work. And the the state I think is there. I think government is always a little bit slow to react. But everyone's going that direction. Open data is the future and there's really nothing stopping it."